For over ten Years, I have been posting articles in my bimonthly email newsletter, The Restored Temple of Hermes, containing an article on Tarot and divination and news about by workshops and publications. For this blog I intend to repost these articles, and once these are all posted, the new articles as they are written. For the first I have chosen one from 2004 on the nature of divination. “Divination” is often defined as an attempt to see into the future – synonymous with fortunetelling. However, this is not really what the word divination means. It is derived from the Latin divinus, which meant soothsayer, which, in turn, was derived from deus, meaning God. Literally it means to get in touch with God or the gods. Most of us learned when we were in grammar school about the importance of the oracles in Greek culture. The most famous was the Oracle at Delphi, where a priestess, called the Pythia, sat on a tripod deep in a sacred cave and communicated with the god Apollo while in a self-induced trance. Inhaling the fumes from burning laurel and barley possibly helped her state. The story that the tripod was suspended over a fissure in the earth that emitted fumes, seems to be a later Hellenistic invention and is unsupported by archeological evidence. The Pythia’s pronouncements were often mysterious and they had to be interpreted by a body of priests, called the Prophetai. It is often said that the statements of the priests were ambiguous – as if they were trying to hedge their bets and make it difficult to say that the prediction was wrong. However, it is more likely that the statements were, at times, unclear because of the symbolic nature of communication with the inner world. When I was in grade school studying the ancient Greeks, I was told the story of a Greek king, Croesus of Lydia, who because he was planning to invade the neighboring Persian kingdom, in 560bce, first asked the Delphic Oracle to predict the outcome. The pronouncement of the Oracle was, “A kingdom would be conquered.” The king, thinking that this pronouncement guaranteed his success, went ahead with his plans, but, to his dismay, it was his kingdom that was lost. This story was popular because it illustrated the supposed ambiguous nature of the oracle and fatalistic attitude of the Greeks. But, this is not how the ancient world viewed the oracles. They saw the oracle as a sound source for advice and wise council. For example, the Athenian ruler, Solon, known as the lawgiver, because he established democracy in Athens, successfully annexed the island of Salamis in 594bce, by following the oracle’s instructions. Later, he credited the Delphic Oracle for the inspiration to convert the government of Athens from the rule of tyrants to democratic rule. Divination was an integral part of ancient religion. In ancient pre-Christian religion, there was no central authority such as the Pope or the Cardinals. Religious decisions were brought directly to the gods and through the oracles the gods answered. For most people, the oracles provided conclusive evidence verifying the existence of the gods. At the oracle of Zeus, in Dodona, the questions that were asked of the oracle were first written on led tablets. Archaeologists have found stores of these tablets and can read first-hand what types of questions were asked. Hardly any questions requested a prediction. The questions include: “Is an alteration to a cult practice acceptable?” “Is a marriage, a journey, or a career choice wise?” “Which sacrifice does the god prefer?” “Will my wife conceive?” “How can I cure this illness?” “Is my child legitimate?” and the most common question, “How can I win divine favor?” Rather than being ambiguous, the answers were primarily yes, no, or by performing a religious ritual or sacrifice. Each oracle had a specialty. 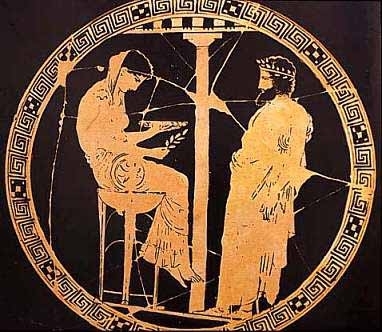 The oracle of Asclepius was devoted primarily to health issues and the Oracle of Delphi was noted for its philosophical and religious statements, but the great majority of the statements contained no predictions. Their aim was to help Individuals improve on existing conditions. When we look at ancient histories and literature, we can see that even when the Greeks received a prediction from the gods they did not sit back and accept fate, but interacted with the gods in a creative way to change fate. This creative use of a prediction can be seen in the following famous example. In 480 bce, The Persian king, Xerxes, amassed a huge army and invaded Greece. Intending to avenge the defeat that his father Darius had suffered at the hands of the Athenian general, Miltiades, during the previous invasion, Xerxes made the destruction of Athens his primary objective. As Xerxes army was the largest the Greeks had ever seen, the Athenians were concerned for their fate, and sent a messenger to consult the Oracle at Delphi. The Oracle sent back this answer, “Why sit you doomed one? Fly to the ends of the earth. All is ruin for fire and headlong the god of war shall bring you low.” Such a prediction of doom would send a fatalistic person into despair, but instead the Athenians held a council to decide what to do. The Athenian general, Themistocles, was sure that there was a way to defeat the Persians, and asked that a second messenger be sent to Delphi. This time the question was, “What can we do to defeat the Persians?” The Oracle’s answer was “Though all else shall be taken, Zeus, the all seeing, grants that the wooden wall shall not fail.” Themistocles, interpreted the “wooden wall” as his fleet of ships. Although the Persian’s fleet had over twice as many ships, Themistocles knew that his triremes, small fast ships with a pointed bow designed for ramming, were superior in capability. The general convinced the population of Athens to abandon the city to Xerxes’ army. Instead of defending the city, he tricked the Persians into attacking the Athenian fleet in the narrow Strait of Salamis, where the Greek triremes were able to outmaneuver the larger Persian ships, ram them, and sink them. The result was one of the most famous victories in all of History. Without the support of their ships the Persian army retreated. The victory also assured the dominance of Athens in sea trade in the eastern Mediterranean. The resulting prosperity and influence helped to usher in the golden age of Athenian art and culture. Help! I have your Tarot of Sevenfold and heard that you wrote a book to go along with it. If yes, what is the title and where can I get it? Please email me back at Schloneger@netzero.com. The only book that I have right now is Alchemy and the Tarot. You can order it through my website. I purchased the Alchemical Tarot Renewed Fourth Edition the perk was One Deck & One book. I also ordered the Hermes Playing cards One Deck & 2New York Lenormand USA. Also I ordered 1 Marziano and 1 Sevenfold Mystery USA. I see the Marziano and Sevenfold Mystery will be shipped in August. Why haven’t all the other decks shipped? Please add me to your bimonthly email list. I am not sure what you are asking, Did you receive the decks that you ordered? If not let me know. I put your email address on my list for the m=newsletter.